We’re so glad we contracted with CalPainting to paint the interior of our home! From the bid to the final walk-through, Billy Flanagan and his team were completely professional in every way. We greatly appreciated Billy’s patience while we made our decision, his oversight of the job from start to finish, and his complete attention to our satisfaction. We would not have known he had several other large jobs going on if he hadn’t told us – we always felt like his top priority, and no doubt his other clients felt the same. His painters were always right on time and did top-quality work; their finesse with trim and hardware was remarkable, and we felt perfectly comfortable having them in our home, whether we were there or not. It was a pleasure to have this big job done so quickly and well, let alone for such a reasonable price. 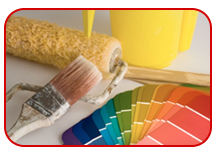 We can highly recommend CalPainting – please feel free to contact us if you have any questions. It has been a pleasure working with you and your company during the painting of my home. I found it very comforting to have such a knowledgeable team to work with, since I know nothing about selecting paint or painting. The entire team at CALPAINTING was always very professional and helpful and I enjoyed seeing the painters each day. I highly recommend using CALPAINTING any time you have painting needs. You and your team are both knowledgeable and polished in this field. CalPainting is hands down the most responsive efficient vendor that I’ve worked with the entire time that our office suite has gone under a interior design makeover. Billy was so friendly & patient with our choice in colors & came to supervise the paint job that was being done by his staff. We needed to get the job done right away & CalPainting was able to fulfill the deadline as well as do an incredible job. I highly recommend using them for services. You will not be disappointed! These guys are awesome! Very professional, speedy and super reliable. Billy was very patient with us while we chose the colors of the house. We were planning to remodel one of the bathrooms and wanted to get it painted after the remodeling was done. He agreed to come a second time after the remodeling job was finished to complete the second bathroom. They are very reasonably priced too. I highly recommend CalPainting!! We had CalPainting paint the exterior of our house. They did a great job, were timely , the price was reasonable and cleaned up after themselves. I recommend them!